Hi there! I hope your week is going well – not too far to go to the weekend (yay)!! 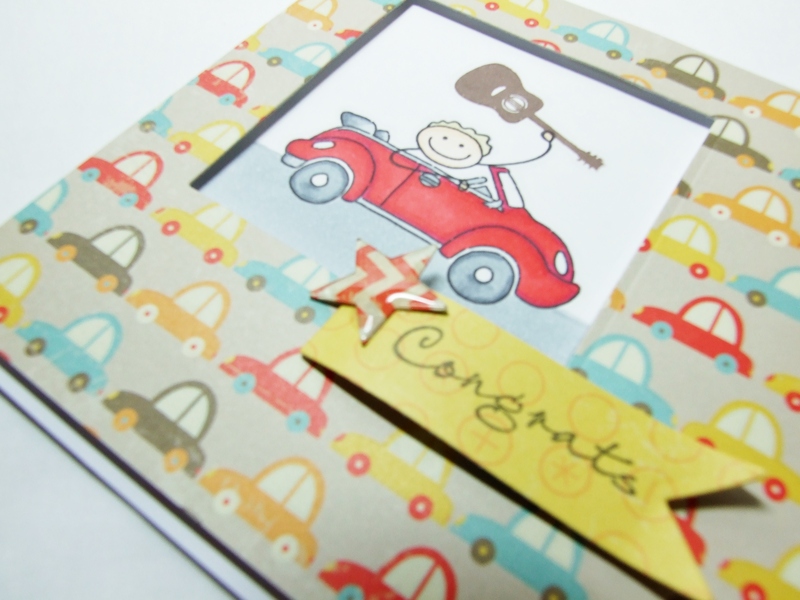 Today I’m popping in to share this card that I have made for a young man who has just passed his driving test. As well as passing his test he is also a bit of a whizz on the guitar. Now, when it came to making this I knew which of my Waltzingmouse Stamps I would use because I’ve used them before to do a similar card for someone else after they had passed their test. 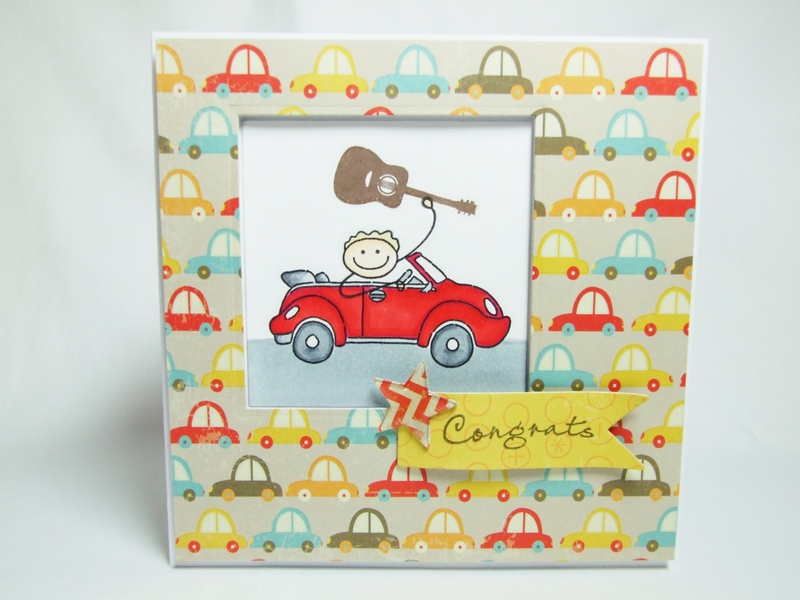 I used ‘Half Pint Heroes’ for the car and the little man and ‘Frame it’ for the ‘Congrats’. But I felt it needed something else, so I had a little look at the gallery on Waltzingmouse. 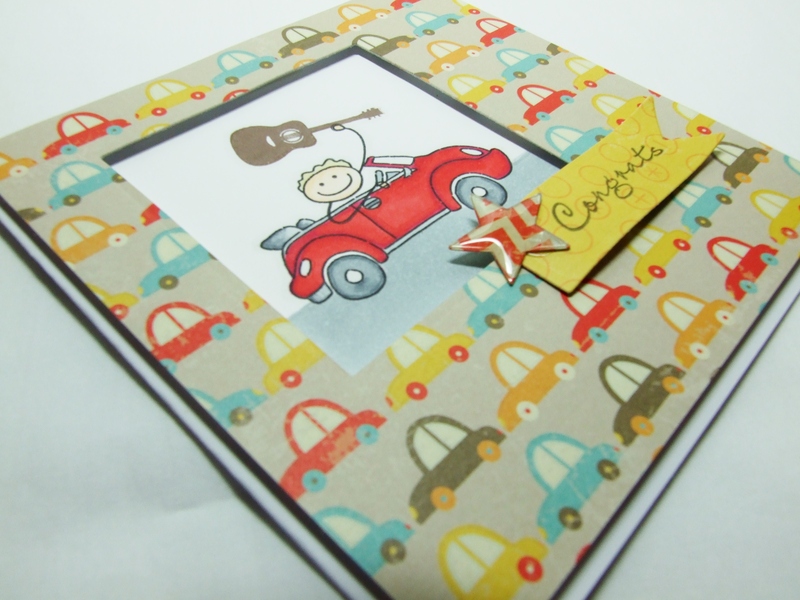 There I found a card by Julia Aston using the same car and man but he was waving a guitar in the air as he drove by!! (You can see it HERE) As luck would have it I do have the set that has the guitar in it – it’s called ‘Back in the Saddle’. So thank you to Julia for that last piece of inspiration I needed to finish this card off and make it even more personal to young Joe. I also used ‘Boy Crazy’ papers by MME, Spellbinders square die and banner die, Spectrum Noirs and a star shaped Epiphany tool. I also used foam pads to raise the patterned paper like a frame. Next > Super VW Snowman!! !